On the banks of Lake Drummond, on the edge of the Great Dismal Swamp, there is a tree in the shape of a woman. One dark, moonlit night, two artists met at the Lake Drummond Hotel, built directly on the borderline of North Carolina and Virginia. One was a young woman with the ability to see spirits trapped in trees and stone, anchored to the earth beyond their years. Her gift was to draw them, and then to set them free. The other was a dark man, haunted by dreams and visions that brought him stories of sadness and pain, trapped in a life between the powers he sensed all around him and a mundane existence attended by failure. They were Eleanore MacReady, Lenore, to her friends, and a young poet named Edgar Allan Poe, who traveled with a crow that was his secret, and almost constant companion, a bird named Grimm for the talented brothers of fairy-tale fame. Their meeting drew them together in vision, and legend, and pitted their strange powers and quick minds against the depths of the Dismal Swamp itself, ancient legends, and time. Once, upon a shoreline dreary, there was a tree. This is her story. This is certainly one of the most captivating and creative accounts of Edgar Allen Poe and his Lenore, as well as the foundations for Poe's infamous poem, "The Raven". Filled with unexpected twists and turns that left me guessing until the very end, David Niall Wilson has proven himself to be an extraordinary storyteller with a keen gift for the macabre. The suspense throughout was spectacular and never did I feel a sense of prolonging. Wilson has put forth everything I could want from such a novel; extremely well-developed characters, suspense, intrigue, and a great deal of unpredictability. As a long time fan of Edgar Allen Poe, this is one of the rare creative endeavors that truly capture Poe's spirit and then goes beyond to create a mesmerizing story within a story. The narrator of this audio edition, Gigi Shane, is equally as talented. Her voice is rather deep and raspy, yet soft and gentle, which only enhances the ambiance of the story. Listening to her was as though I were enveloped in an old quilt; a bit frayed and rough on the edges but warm and comforting as it drew me in. Her narration was astounding and truly brought this novel life. My overall experience with this particular audiobook was astounding and I sincerely could not ask for anything more. I highly recommend this to any fan of the macabre and Edgar Allen Poe in particular....FIVE stars! Nevermore is story of a younger Edgar Allan Poe. In this story of how the Raven came to be, explores a possibility where Edgar Allan Poe meets Eleanor MacReady (aka Lenore)at The Lake Drummond Hotel. Both artist and writer are compelled to come to The Dismal Swamp. With the accidental meeting between Lenore and Edgar Allan Poe, each discovered that they both have a gift. Lenore's gift as an artist is to free spirits that are trapped in objects. Edgar's gift (obviously) is to tell stories. Lenore and Edgar are pawns in the battle of good vs. evil in this supernatural story. 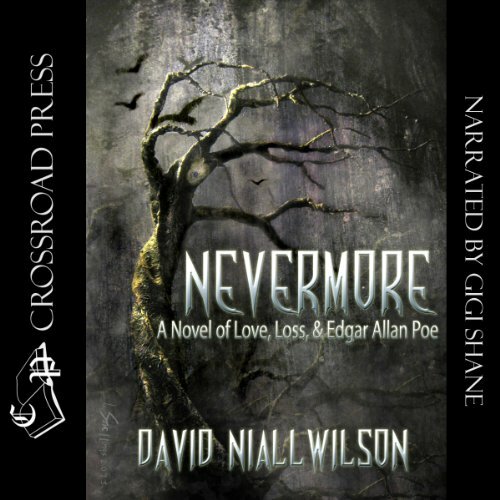 The author David Niall Wilson does an excellent job of keeping with the gothic writing style of Edgar Allan Poe. As with all of Edgar Allan Poe's gothic stories, it always has a melancholy ending. I could listen to this story over and over again. The narrator, Gigi Shane tells the story in a very interest way that capture the characters and that melancholy ending of the story. I do recommends this audiobook to Edgar Allan Poe's fans. They will not be disappointed especially of telling how the Raven came to be and the mysterious woman,Lenore which is mentioned in the poem. If you could sum up Nevermore in three words, what would they be? What other book might you compare Nevermore to and why? Have you listened to any of Gigi Shane’s other performances before? How does this one compare? No, but I would...she is pleasant to listen to, and talented! This was a good listen, I was drawn in from the beginning and enjoyed the creativity and imagination of this story...it is kinda like an old school urban legend, and I loved Lenore and Edgar's friendship....I loved how she transformed Grimm, and I enjoyed the whole story immensely! I recommend!!! I learned in high school, then reinforced in college, that I am not a fan of Edgar Allen Poe. I was reluctant to read this book but I decided to give it a try because of a strong recommendation from an acquaintance in one of my reading groups. After all, it's not actually one of Poe's stories that I'd be reading, so why not try? The story was well written and I was very pleased with the narrator's voice. I enjoyed the main characters in the book. Enough to become vested in their stories and their fates. Similar to Poe's writing, there is a thread of darkness and solemnity in the undercurrents. The book leaves me with lingering questions and unsettled feelings about the futures of the characters. I know that uncertainty and regrets are part of life's tapestry for all of us but it's not my preferred reading theme. If there was a sequel with resolutions, I'd probably read it but I'd be hoping to walk away with a better sense of "good will prevail" when I'm done. Gigi Shane has a great repertoire of voices! The book was well narrated, I don't think I would have stayed with it if I was reading it myself. This narrator helped through the boring parts. Narrator-4*; Book-3*. Yes, I thought it was enjoyable. What was one of the most memorable moments of Nevermore? The fate of Lenore is quite memorable. The story is very atmospheric with a memorable depiction of the swamp. I have mixed feelings about the narration. I thought overall it was very good for the story; it captured the atmosphere, but was not quite right for Poe as a character. This was a minor flaw. Would you try another book from David Niall Wilson and/or Gigi Shane? What three words best describe Gigi Shane’s voice? Do you think Nevermore needs a follow-up book? Why or why not? Yes and no. It is fine as a stand alone, however a sequel could bring an alternate concrete happier outcome to Lenore's ultimate fate as well as the fate of the young princess. So although there are not exactly any loose ends, there are ends that are not tightly knotted. The story was in a style similar to that of Poe's stories. We learn just who Lenore was in the novel. The story is a surreal dark fairy tale with a bittersweet ending. Overall the story was a bit too surreal for my personal taste. I listened to the audible version of this.I found it good,not great.It was full of imagination,mysterious circumstances and a very interesting idea of where Edgar Alan Poe got his idea for 'Lenore'.I found Gigi Shane to be a good narrator.She kept up with the unusual pace of the storyline pretty well.I may read it again when I get time to see if I missed anything. "I was provided this audiobook at no charge by the author, publisher and/or narrator in exchange for an unbiased review via AudiobookBlast or MalarHouse dot com"
Creepy chiller will give you goosebumps! The setting. Absolutely brilliant, gave me the creeps all the way through. Perhaps it was the creepy swamp filled surroundings but centainly set a very creepy backdrop for what was a very well written story. The scenes towards the end with Grimm. I was creeped out, which doesn't happen with the vast majority of horror novels I read so this certainly worked. This is the second book by author David Niall Wilson I have listened to (first being Ancient Eyes) and I have throughly enjoyed both of them. In addition the Narrator Gigi Shane was really enjoyable, she had a soft slow soothing voice which worked well for this story. *This audiobook was provided by the author, narrator, or publisher at no cost in exchange for an unbiased review. I have tried multiple books by David Niall Wilson and intend to continue trying more along the way, and in terms of Gigi Shane if she narrates another story I'm interested in I'd be interested in it. Would you be willing to try another book from David Niall Wilson? Why or why not? I would because thusfar I've listened to Ancient Eyes and Block 10 which were both written by him and more my kind of stories. I have not so I cannot really comment on that fact. Was Nevermore worth the listening time? I believe that yes it was worth the listening time because it's an interesting story with a original premise that has some cool interactions with reality and draws parallels between a bunch of different things. The reason the rating isn't higher is not because its not a well-written story, its because it tells a different story than the one I really wanted to hear. I received the code for this audiobook in exchange for an honest review.